Introduced in 1951, the Fender Precision bass is a landmark instrument, and influenced the way that music is performed and presented. 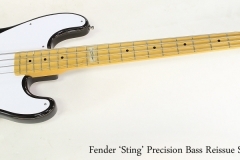 Easily and consistently providing a precise pitch – hence the ‘Precision’ name – was a new concept for bassists, who all used upright, acoustic fretless instruments. And not only was the pitch predictable, the bass was portable! All that was required was appropriate amplification. 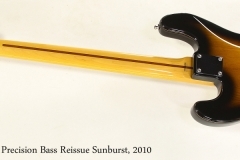 By 1953, the Precision Bass was a huge hit and began to evolve. Comfort contours were added to the back and to the lower bass bout. The original single coil pickup was still in use – the now-standard split humbucker P-bass pickup didn’t arrive until 1957. Built by Fuji-Gen in Japan during 2010, this Fender ‘Sting’ Precision Bass Reissue is in great condition, though it’s not entirely original. The original tuners have been replaced with Gotoh ‘reverse’ models, as the 1953 would have been fitted with. Importantly, the original pickup has been replaced with a Lindy Fralin ’51 Reissue pickup, and by all accounts this is sonically a significant improvement. The original pickup is included. The output jack plate has been replaced with an aftermarket, period correct version, and the bass has received extra shielding. String with new flatwounds, the bass plays very nicely. A Rock Bag gig bag is included.